A hotel in Glasgow called the Intercontinental about a year ago, a man was staying there with his son. At the end of dinner one evening the man went up to the maître d, saying thank you for a wonderful dinner. “You’ve probably seen us coming here on a regular basis. The reason I come here is that my son is having treatment for Leukemia nearby. Unfortunately it’s not working and tomorrow we are starting chemotherapy. Tonight we’re going up to his room and I’m going to shave his head completely bald and I’m going to shave my own to be supportive of him. The reason I’m telling you is that I know it’s going to be a bit of a change and a surprise for everyone working here and I wonder would you be able to ask them not to stare when we come down for breakfast.” When the two of them came down for breakfast the next morning, five of the waiters had shaved their heads. the snag-toothed hustler with red hair. Using extracts from Donnacha Rynne’s Being Donnacha (11 & 16), Mikhail Bulgakov’s A Country Doctor’s Notebook (‘Morphine’), JD O’Connor’s BMJ ‘Looking Back’ piece about her days practising in the Yorkshire Dales, Carlo Levi’s Christ Stopped at Eboli and Julia Donaldson’s version of The Magic Paintbrush, we discussed various representations of neglected, forgotten and exploited groups of people/communities and how different types of people perceive them and react to the inequality in different ways. Like Donnacha says about “people promosing to visit and then not doing so”, leaving him feeling that “there is always something missing from my life”, so too is Polyakov (in ‘Morphine’) let down and abandoned by his profession, and so too the people of Gagliano & Matera (in Christ Stopped at Eboli) have been forgotten by progress and medical science (unlike the people of Yorkshire?). 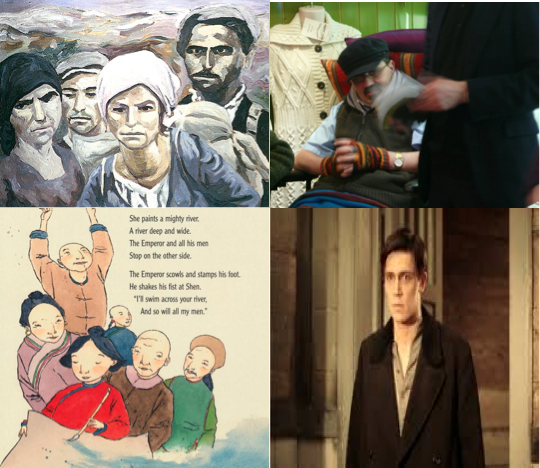 In contrast, Shen (in The Magic Paintbrush) does not abandon her people OR her principles; Levi loves the peasants and cares for them like a saviour; O’Connor, like Shen, is already one of the community in terms of class, though she has to overcome the cultural and gender divide to be fully accepted and trusted. Donnacha and Luisa (Levi’s sister) feel angry and would like something to be done, but Donnacha is unfortunately confined mostly to expressing it and internalising it, whereas Luisa and Shen (and you) have the privilege/responsibility/ability to act on it. Or maybe, like Levi and Bomgard (/Bulgakov) you will be more inclined to draw attention to the problems you witness through writing and thereby inspire others to act. In your medical career, you WILL encounter your own Gagliano/Gorelovo/Yorkshire/neglected group, and the system/society (Emperor) will try to turn you away from being overly concerned for them. Whether you use your paint brush like Shen to act or like Levi to reflect, just make sure you don’t turn your back entirely (unless it is to protect yourself from too deep an engagement which could threaten your OWN well being).